Last year Buba and Missy Moo were far too young to comprehend carving pumpkins. Buba was just old enough to request that I carve Mickey and Minnie Mouse for him and his baby sister but he didn’t know what that actually meant. At the time it was all about Mickey and Minnie Mouse so I am pretty certain it was a fluke. However, this year things have changed, Buba has grown up so much and is really into celebrating Halloween this year. He was ever so excited to pick out his Halloween costume on his own, dress up for his first Halloween party of the year, on Monday and asked me to carved pumpkins with him. I couldn’t pass this up, I love carving pumpkins. So while Missy Moo napped and Buba and I had some one-on-one time together I thought it would be the perfect time to carve a pumpkin together. I handed him our tools, our handy-dandy Oxo Good Grips Fruit Scoopers, which made it so easy for both of us to scoop out all those pumpkin seeds and guts. The orange, large fruit scooper was his favorite as you can see! First things first, we have to cut out our lid! I use a grated knife as it’s easier to saw the lid out in an octagon sort of shape. 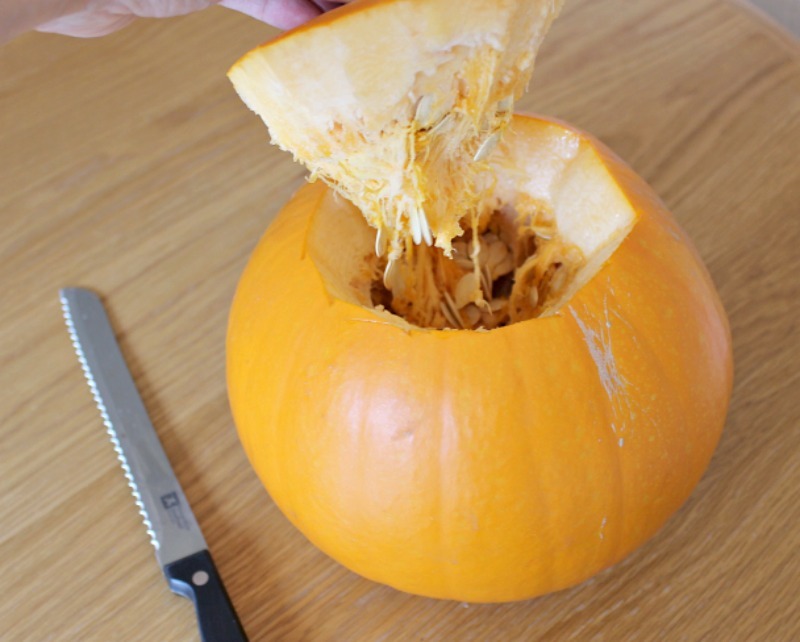 Make sure to angle your knife inward so the lid doesn’t fall straight into the pumpkin, it leaves a ledge for it to sit on. I use a large picnic table cloth on the floor, so that Buba could scoop those pumpkin seeds right onto the floor without making a big mess. And we got stuck in getting those pumpkin guts hollowed out. 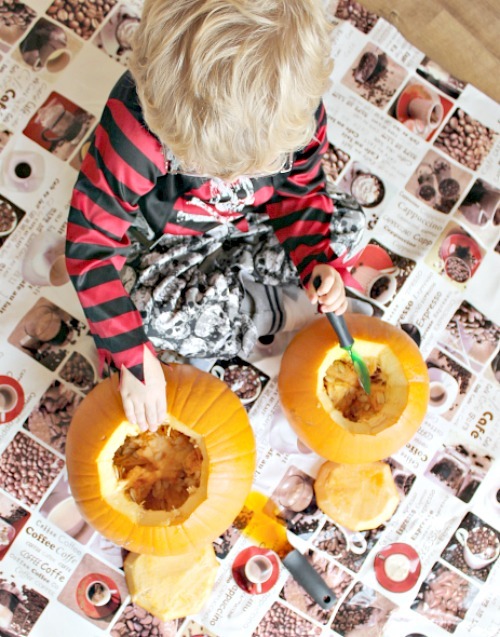 Buba is still too young to handle pumpkin carving tools or knives so the scooping was his task. He did brilliantly after he got the hang of it. You can see how easy the fruit scoopers are for kids to use. I look forward to trying them out on melons and kiwis too! I love that they have big rounded edges safe for kids to use and a good handle to grip. 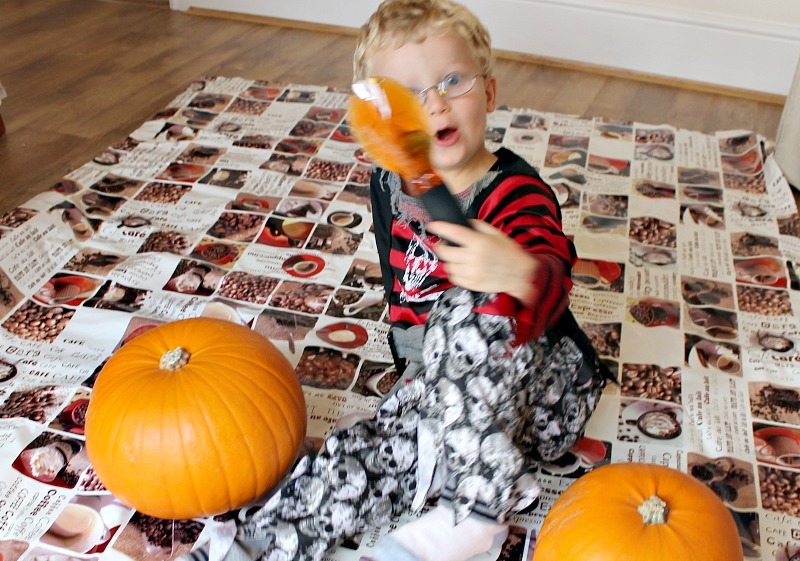 Even though Buba’s hand was covered in pumpkin goo, his hand didn’t slip off the handle. I am no artist and the characters my kids request are not the easiest to draw and carve out if you don’t use my easy to follow, quick carving tip. Whatever they may choose, google image it, use PicMonkey.com to resize to your pumpkin as most images and templates you find on google print out A4 size. 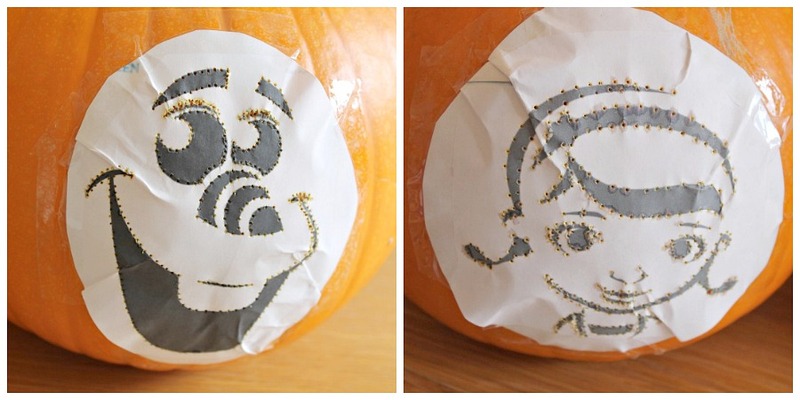 Cut out your character as close to the face as possible and tape completely around the character to the pumpkin making sure it’s as flat as possible. I use the back of a meat thermometer or use a poking tool from a carving kit to make tiny dots along the entire taped template then remove the paper. 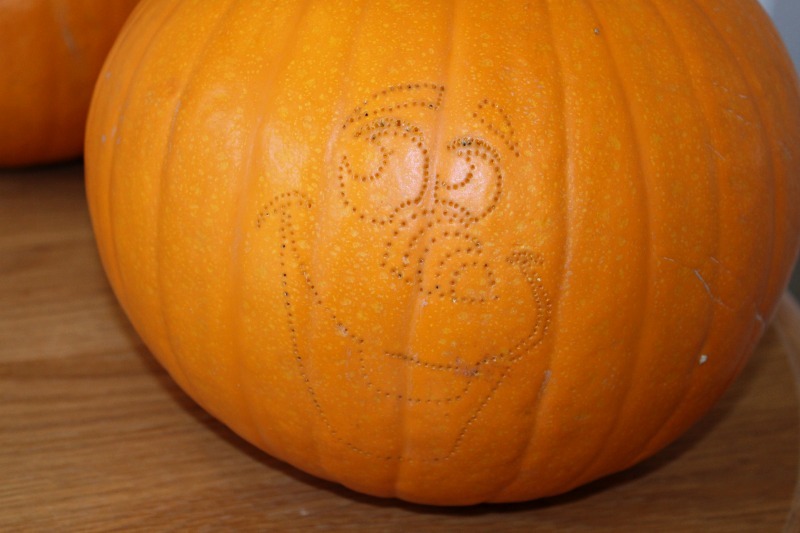 You will be left with this perfect outline of your character on your pumpkin. Then it’s just a case of connecting the dots. Start from the top and work your way down through the face to the bottom. If you start in the middle tiny pieces can break easier as there isn’t as much support. If you do accidentally cut into another opening, use a toothpick to pin it back together. 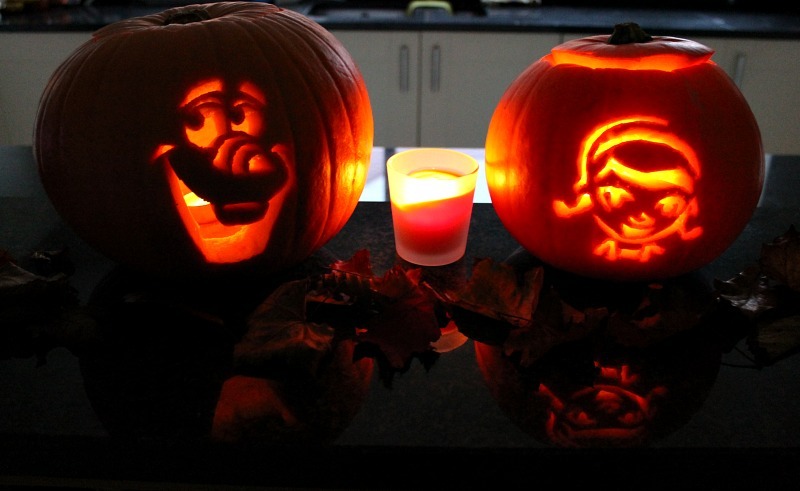 Here are my two finished Olaf & Doc McStuffins Pumpkins carved out. During the day we have them outside on our front porch or on each side of our stairway. At night we like to light them on the kitchen island or put them in our living room front window to show them off. 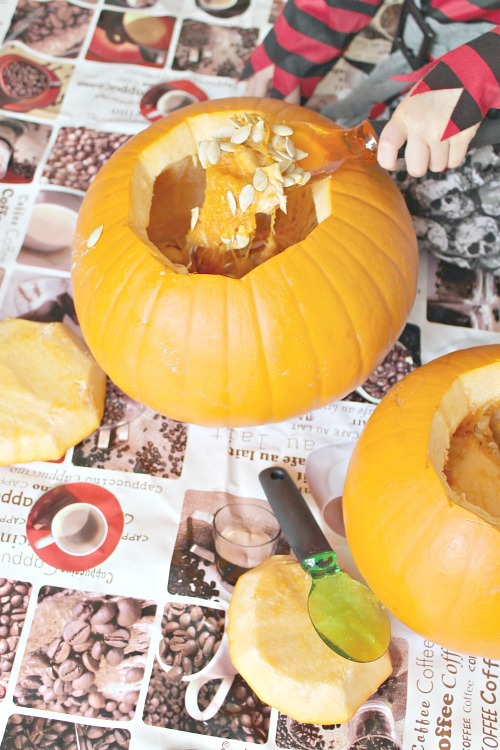 As you can see, it is so simple to make any fancy pumpkin carving! If I can do it, so can you! 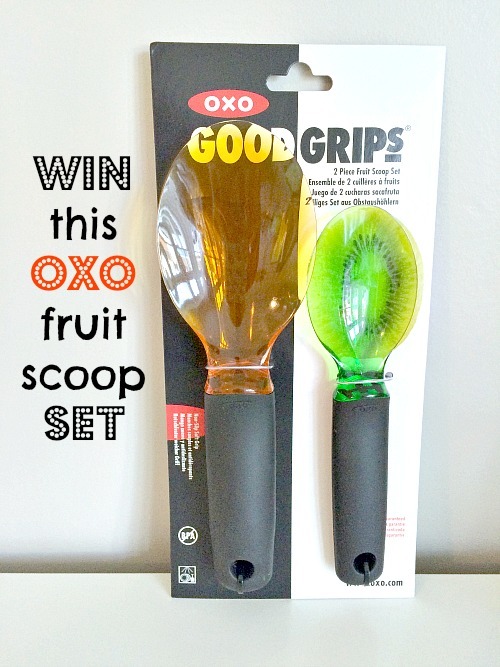 There is more… one lucky reader will WIN their very own set of Oxo Good Grips Fruit Scoopers! Get your entries in below, you don’t want to miss out, these are fantastic! * we were sent this fruit scoop set for the purpose of this review but all photos, opinions are our own. Thanks Kelly so sweet of you. Yes do it’s so easy. Once you have done it, you can do any character! Thanks Charlotte. Yes was very pleased how they turned out. It’s easy you can do it too. Go for it. Tweet or instagram me the after photo… would love to see! I Love the olaf pumpkin! 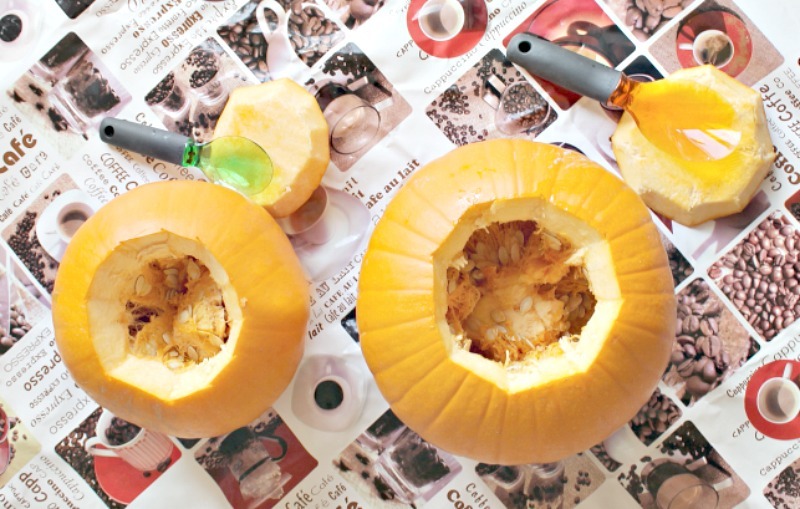 We discovered this method last year after the kids requested some pretty bizarre pumpkins, I’m not the greatest of artists either but this way is so handy! The scoop looks great, using a normal spoon is always a messy job, may have to look for one of these! Thanks hun. Yes do or enter the giveaway to win one!!! lol Such a great tip isn’t it? We did it as kids too. Thank you Becky!! They turned out better than last years. Thank you so much. We loved how they turned out. Thank you MacKenzie. We were glad how they turned out. I’ve never carved a pumpkin before, I have a fear I’d accidentally slit my wrists with a pen knife. I would love to give it a try though! Oh in that case use a pumpkin carving kit. They have little plastic covered tools so its more safe and easier even for kids to use. Thank you so much for pinning. Always feels amazing when someone says they are pinning something of mine. Lol enjoy carving. Those are brilliant – and I love the idea of using a skewer to mark out a template – I’ve only ever done freehand carving before and it wasn’t anything like as impressive; thank you for the top tips! Best of luck. It’s so much easier than you think my lovely. 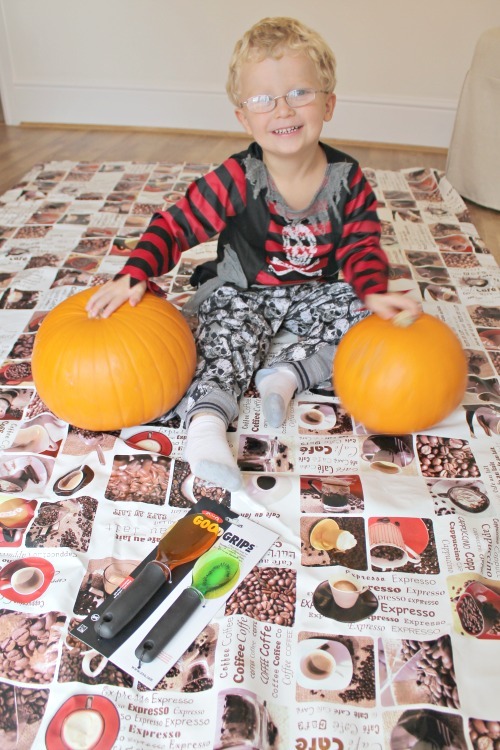 The pumpkin carving tool kits are great too to saw out little pieces if you can find one. Either way, I bet you will do brilliantly. Now I feel silly – you make it look so easy!! It never occurred to me to actually use a template, I just kind of make it up as I go along!!! Hopefully I’ll have a better dressed front door this year (I quite like the fact I’ve got all of half term before the high night itself to get ready for trick or treating!). Exactly, go carve to your hearts content now. You can make anything out of a pumpkin. Just google image it. lol Thanks lovely. Not a bad idea having an inflatable one. lol Love it. Might have to get some myself. Thanks Louise, It’s so easy once you have done it I promise. Don’t forget to get your entries in to WIN some helpful Fruit Scoopers too! 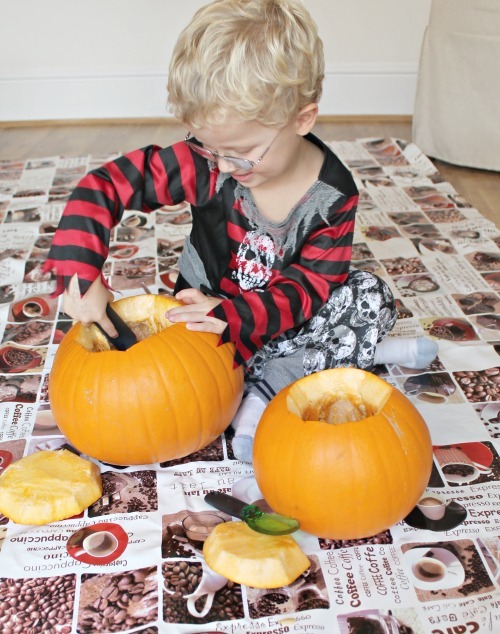 They are great so the kids can carve pumpkins too! Thanks Laura. Oh yes so much easier this way. Great work Jenny! I’m pretty allergic to drawing but I think even I could manage this! Thanks for the inspiration. I am too. I cant even do stick people. This is so easy though. Try it. The pumpkins look great. We did a boring one last year, but I’d like to do something a bit cooler this year. Do it its so easy promise. The kids love picking out characters for them too. I did find one. I am hoping to take the kids this Saturday. Fingers ctossed the weather holds. This is how I carve my pumpkins and it makes it so much easier and more fun when you’re not frustrated when the shape isn’t going right 🙂 Love Olaf!!! Exactly, ever since I started this I have always done it. I used to get so frustrated. lol Thanks Helen. Thanks hunny. Yes do, once you get the hang of it, it’s super easy. I promise. Thank you so much Shannon for your amazing comment. I do like to share my tips that help me do things more easily and better as a parent. We only learn by doing and sharing. lol 🙂 Glad you like it. So cute!! My Princess loves Doc McStuffins, so I can see us giving this a try! Thanks fantastic. It’s so easy I promise! Do it I promise it’s so easy and you will never go back! Make the girls Elsa and Anna pumpkins hahahaha Thanks hunny. Try it next year you wont go back. Once you do it its so easy. Hahaha yes let the kids pick out a character to carve. They love it. Brilliant! I’ve never attempted to carve my own pumpkins but with the scoops it doesn’t look too difficult. I love the idea of the template too. You always see scary faces but I love the idea of using different characters. They look fab! Oh yes in america we carve everyrhing not just scary things. We also dress in all costumes not just campires witches abd zoombies. Its more little kid friendly halloween. I love it. Grace says – WOW!!! Awesome……………..
Oh thats why inuse a picnic table cloth no mess just wipe off with a baby wile abd roll back up. Its tge easiest way i know as i cant draw at all. Try it next year the kids love picking out their own. If i could do it hunny you can. If you adent good at carving use a pumpkin carving kit they make it easier. These are fantastic and such a good idea! Thank you Kay! They were fun to make! Hope you got your entries in to WIN a free Fruit Scoop Set too. Thanks Aby they were so fun to make! Hope you got your entries in to win a fruit scoop set too! Thanks you so much Lystra for stopping by and commenting. Glad you liked it. Hope it helps make carving easier in the future. And hope to see you again here soon. Get your entries in to WIN a fruit scoop set too! Thanks hunny. Do it. Honestly i am no artist or crafty and i could do this. You use a template you can do anything. Its fun. Try it out. Tweet or instagram me a photo i will share it. Omg how cute are they?! We are doing pumpkins tonight and I am so excited as it is my first time carving one! I am doing a minion and the boy is doing a puking pumpkin! Fingers crossed! OH that sounds fantastic. Good luck. And thanks for stopping by and commenting. Enjoy! Oh google something your little one would like to see and try my tips! It’s so easy I promise. Good luck. Look forward to seeing what you come up with. Thats grear. Nothing wrong with just going for it. Hahaha its fun. That’s fantastic Natalie! Did you use my tips? I hope they helped. Its great to get excited about your own masterpieces. I loved how ours turned out. Thank you. It’s really simple and it’s so helpful I am no artist and need all the help I can get for sure. Glad you like it and hope it helps you the next time you want to carve fancy pumpkins. Thats fantastic. I am so glad to helo. Tweet me a photo would love to see it. Thanks for stopping by and commenting. Genius pumpkins! Isn’t it always the way that the best ideas are often the easiest!? Exactly. it’s so easy as I am no artist. If I can do it anyone can for sure. Thanks for stopping by and commenting. I hope it helped you make some lovely pumpkins. Looks great, pumpkin carving is an art! Definitely but this really makes it so very easy. I promise. I am no artist and I did these. No problem Lauren. I literally just google images olaf stencil and hundreds came up. I think it was the fifth one. There are so much. Then I used picmonkey.com to resize to my small pumpkin as they print out I think A4 size. Enjoy. We also google for images, often owls or cats. Oh yes you can google any image for your pumpkins even words. LOL thanks for stopping by and commenting. I used a template, but couldn’t work out what to use for the holes (durr, I have skewers I could have used!) so ending up cutting out the relevant parts of the paper then drawing round it. I should really do as people advise. The carving kit I bought had a useless bendy knife in it too, so I used N’s kiddy cutter knife I used last year, but this year managed to break it. Oops. Next year, I shall buy a decent kit! Hahaha well hopefully my tutorial will make next year so much easier darling. Good luck. Happy halloween. Oh thank you so much that’s so very sweet of you. I look forward to having a peak at it. 🙂 Appreciate the share.